November 19, 2010 — Austin has been a member of the academy for the last three years. He moved from Muscle Shoals, Alabama to be a part of a family environment with high quality coaches and players that was conducive to his development. Austin found a second family for himself and the coaches at the academy found the same in Austin. He has experienced great success on the tennis court, but at times it wasn’t easy as he has battled through injuries and is now a stronger person for it. Everyone at Smith Stearns has seen Austin grow into an honorable young man who is driven, hardworking and never gives up on his goals. His drive to succeed is the main quality that will continue to make him successful in all areas of his life. 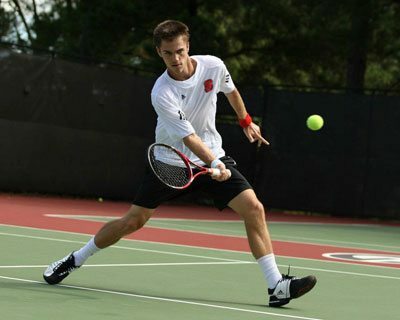 Austin credits the guidance he has received from the Smith Stearns coaches, specifically B.J., who has helped him achieve his ultimate goal of going to an exceptional college tennis program. He recognizes the close knit nature of the academy as the perfect situation for him to develop and can’t imagine spending his last three years anyway else. When you are at an academy for a few years you have a lot of great memories, however the one that is most memorable to Austin is grinding with B.J. at 6:00 a.m. on Monday and Wednesday mornings for a whole semester, even if it was 20 degrees outside or 3 feet of visibility! He notes that there are not a lot of coaches who will be out there at all hours working with a student who wants to hit cross courts that early, however, it wasn’t as difficult as he may think if you have such dedicated student like Austin to work with. He states that he will always reflect on that experience and appreciates all that B.J. has done for him as his coach and a dear friend. Another experience that stands out to Austin is the relationships he has made with the coaches and players. His expectations have been beyond exceeded in this area and it is something he will never forget. Austin’s hard work has always paid off as he has experienced tremendous results throughout his junior career. He has consistently been one of the Southern Section’s top players and in the boy’s 16 and under division he was ranked #1 in the section and top 25 in the nation. Ultimately, Austin views his collegiate commitment as his proudest athletic accomplishment, because it is an accumulation of all the hard work and results he has had up until this point in his career. He is equally as strong from an academic standpoint as Austin has maintained all A’s throughout high school and has a GPA above a 4.0. Another off-court achievement that stands out to Austin is getting the opportunity to get his pilot’s license during the time he was out injured for ten months. Austin will be a part of the Wolfpack next fall as he will be attending the North Carolina State University on a tennis scholarship. He chose NC State because of the opportunity he will have to play there and make a difference, while continuing to develop with the help of the coaches, Jon Choboy and Stephen Ward. Austin is most looking forward to being able to compete for a national title with teammates that he loves being around. Just the thought of being around a great nucleus of guys striving for the same goal makes him excited. He is also ready for the thrilling experience of playing tight matches that come down to the wire, where the pressure is on and the support from the sidelines is endless!